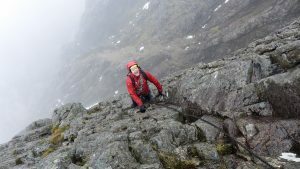 Keith and I headed up to the Raw Egg Buttress of Aonach Beag on my first day out and ended up climbing a recently highlighted route called Top Gun…good climbing on various tiers of the crag between big ledges. A good high crag with stacks of potential for hard new mixed lines! The weekend hit rate for climbing would be fairly challenged by the undecided weather and the most reliable routes were high snowed up rock that were steep enough for turf to be frozen as well. 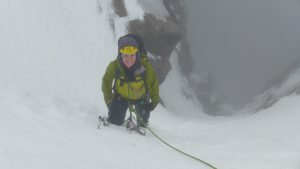 The season’s highlights for Keith and I were Poco Loco Direct on Church Door Buttress and the famous Unicorn on the cliffs of Stob Coire nan Lochan. I’d tried this about 20years ago with Dave Hollinger…he cruised the first pitch, but our late start and my limited experience above grade V at the time forced an abseil off. This time went well and I’d recommend it to anyone who likes a good thrutch! Central Gully Rhand on good snice! On the work side of things I was lucky enough to be on the West Coast nearly all of the time as conditions were often pretty marginal. Here you can climb a variety of classic routes that aren’t too condition specific like the big ridges on Ben Nevis and on the Buachaille. There are few good options like this it seems over East with the Northern Corries being the source of most doom and gloom. There were a couple of weeks of reasonable weather and conditions that made for excellent climbing and I had a great time doing what I’d been teaching others to do on the BMG courses in January. I was lucky to run an MIC Training course for Plas y Brenin with an excellent bunch of committed mountaineers at the beginning of February…coinciding with a lucky hand from the weather gods! Apart from this the majority of the other weeks were guided climbing with no NGB syllabus or grade cap. Guiding the classics like Gargoyle Wall, Cutlass, West Chimney and Crest Route amongst many others. My final week was working with the Mountain Medics…a varied week from Ledge Route (classic mountaineering Route up to Ben Nevis) to Droidless ( a neat Grade VI on the accessible Mess of Pottage, Cairngorm) as well as lots of informative lectures and medical training. And to end with a weekend with Mountain Equipment getting photo stock for new product with Rich and Lukasz. Lukasz did some magic with his camera to make some stunning images in some pretty grim weather. Of course this winter season was far from vintage…thanks to everyone who I got to climb with and who committed to making the most of it! And the Evans for salvaging a wet day and earning an afternoon coffee at “Crafts and Tings”!!! Dave climbing Agag’s Groove…big boots, big gloves and desperate!